These days I’m all about quick dinners. Besides the usual after work time crunch, who wants to spend extra time in the kitchen on these beautiful (and sometimes hot!) summer evenings? Stir-frys come together fairly quickly and are perfect for using all the veggies in your fridge. This recipe packs a fiber punch from the veggies, and the amount can be increased even more with a high fiber base such as brown rice. For this recipe I chose to use a Jasmine rice instead to add a layer of flavor. On the other hand, the canola oil is a neutral flavor and better for high heat cooking than olive oil, which is why I’m using it here. I’ve found shrimp to be a good, quick-cooking protein (~3 minutes and you’re done!) and makes any meal feel a little more fancy. The shrimp can easily be eliminated for a delicious and nutritionally complete vegetarian or vegan meal. 1. Heat the canola oil in a pan. In a separate pot cook the rice according to package directions. 2. Toss the carrots and broccoli into the pan with the oil and add a pinch of salt and pepper. After they begin to soften add the mushrooms and asparagus. Add more oil as needed to ensure the vegetables don’t burn. 3. 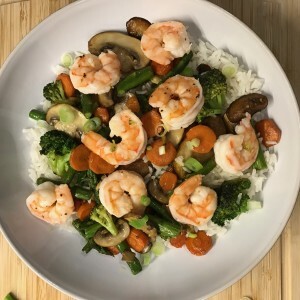 When all of the vegetables are soft add the scallions, sesame oil, ginger and shrimp and cook until the shrimp are opaque white in the center, ~3 minutes. 4. Place the rice in a bowl, spoon the stir fry on top and enjoy! 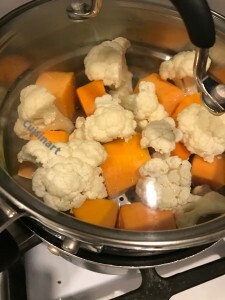 If you’re looking for a fast, all-age friendly way to cook vegetables and proteins, look no further than the funny pot with all of the holes on the bottom that fits in your go-to sauce pan. Until I had kids I rarely steamed foods, but it’s now my default for making soft veggies for young eaters. The beauty of steaming is that vegetables can be cooked to varying degrees of tenderness in under 10 minutes, which is just enough time to prepare the rest of your meal (especially when you have hungry mouths to feed). Steaming is also a quick way to cook greens such as spinach, kale or Swiss chard. I typically bake my chicken or fish, but both can be steamed, as can shrimp, which means you’re only a few minutes away from making pasta, salad, or your veggies and grains a bit more fancy. Looking for more ways to eat healthy? Check out the Healthy Cooking category, complete with techniques and recipes.